Richard Solly, the Co-ordinator of London Mining Network (LMN) was one of four civil society representatives called to give testimony today before a Department of Business Innovation and Skills Parliamentary Select Committee on the extractive industries. The other representatives were from LMN member World Development Movement (WDM), Christian Aid and WWF-UK. Those presenting had already submitted written evidence to the Committee. (LMN’s evidence can be viewed here and all written evidence here). The enquiry is reviewing a number of issues, and although it is clear that part of the brief is to review the benefits that the extractive industries bring to the country, it has also touched on the clear reputational risks that can be associated with UK-based extractive companies. Recent scandals at companies such as Bumi Resources and ENRC should be enough to prove that light-touch regulation isn’t working in the City of London. LMN’s recommendations are that a statutory body, such as the Financial Conduct Authority, be given responsibility, funding and institutional capacity to enforce good conduct on all UK-listed extractive industry companies, including those trading on the much under-regulated London Stock Exchange’s Alternative Investment Market. That should stretch beyond just matters of fiduciary responsibility to shareholders to compliance with human rights, social and environmental standards. It was clear for a number of reasons that the committee took this seriously. We were grateful for the opportunity to present with our colleagues, and it was noteworthy that Richard was called upon to speak first, and fielded the most initial questions expanding on the written evidence. It was also gratifying that so many of the Committee members were able to attend (according a straw-poll of one person who had watched all Committee meetings to date, it was the best attended). The chair of the Committee, Adrian Bailey MP, was interested to know why so many NGOs were working on the extractive industries. It was interesting to see that perception from MPs, and Richard was clear to stress the serious impacts in the exponential growth of the extractive industries, especially on land-based and indigenous communities. Richard was to return to this theme through his responses, stressing the primacy of community needs, and also persuasively arguing thatcommunities’ campaigning was one of the most important factors in change. Even some of the positive arguments for extractive industries were questioned. At one point Richard noted that if there is reporting on jobs, then it should be a net reporting (i.e. to show the number of jobs lost in areas other than mining as well as jobs gained from mining). It was of note that all four representatives stressed time and again the need for better regulation of the extractive companies. This came in many different forms, in responses to different questions, but the point was made time and again; be it on financial transparency and accountability, on carbon reporting, on human rights and social impacts or on environmental issues. Susanne Schmitt of WWF-UK stressed how good regulation was necessary for investors to manage risk and quoted a company representative saying that good companies want good regulation. Alex Scrivener of WDM at one point referred to the correspondence LMN has with the Financial Conduct Authority, and how they were failing to take responsibility. At one point there was an attempt to explore the differences between the positions of the speakers, but the responses came back that they had greater similarities than differences. In response to one question, Richard noted that environmental and social regulations should be possible. If the UK can enact a Bribery Act with global reach, partly for business reasons but also because it is the right thing to do, then such regulation should be possible. The Committee also frequently asked for specific data and suggestions (for instance around best practice in other stock exchanges). It was noted at one point this would be to assist in the the framing of any proposed changes to legislation. The session lasted just over an hour and a half. A video recording of the hearing can be viewed here. 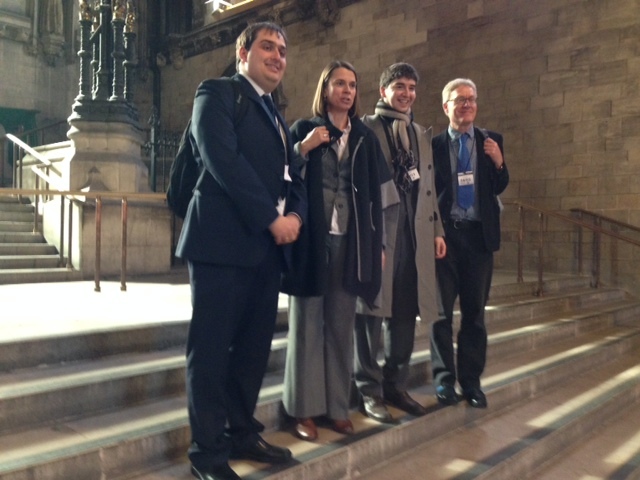 NGO witnesses in Westminster Hall after the parliamentary hearing. Left to right: Alex Scriver, WDM; Susanne Schmitt, WWF-UK; Joseph Stead, Christian Aid; Richard Solly, London Mining Network.